v. : ; 26 cm. Economics, Statistics, and Cooperatives Service, U.S. Department of Agriculture. Issued, 1936- by the Bureau of Agricultural Economics; <Oct.-Dec. 1953>-Feb. 1961 by the Agricultural Marketing Service; Apr. 1961-Nov. 1977 by the Economic Research Service, U.S. Dept. of Agriculture; Feb. 1978- by the Economics, Statistics and Coopertives Servie, U.S. Dept. of Agriculture; <Nov. 1980-> by the Economics and Statistics Service, U.S. Dept. of Agriculture. estimates for Argentina and the United States. crop may result in an increased foreign demand for United States wheat. erably in excess of domestic needs. Hemisphere marketing, which usually become an important price factor in January. and in Southern Hemispherc countries. vesting difficulties experienced this year. averaged only 13.0 percent compared with 15.7 percent in 1936.
and sowing prevailed throughout the Danube Basin. generally good throughout Europe, with the possible exception of Northern Italy. In North Africa insufficient rainfall is reported. Greece ...* ...... : 12 13 15 21 13. 1/ Forecast by European offices of the Bureau of Agricultural Economics. Sweden in years when any of these countries were net exporters. L/ ess than 500,000 bushels. 5/ 1et exports of less than 500,000 bushels. 6/ Includes 2 million bushels net imports by Sweden. jj Includes 1 million bushels net imports by Czechoslovakia. those of last season as a result of the large -.arvest in that country. remains at about 26 million bushels. It is estimated that about 20 million'"
,able to get some 1938 crop wheat from North Africa by late June. of wheat again if it can be satisfactorily arranged. of other bread grain saving measures, including higher extraction percentages. the reduced quality of both rye and wheat bread. potato flour was required in rye flour. tion inherent in the admixture will reduce bread consumption. products made of white wheat. wheat which may be furnished by the various exporting countries in 1937-39.
from Soviet Russia from July 1 to December 17 amounting to 30 million bushels,. July 1 to December 11.
bushels respectively for these two countries in 1936-37.
to have already begun purchasing grain for that purpose. offices of the Bureau of Agricultural Economics. practicable to obtain enough rye fror abroad. million bushels of bread wheat and 4 million bushels of durum. : iil.bu, sn. I.1il.bu i i. M l.bush. Mil.bush. utilization for the year, minus monthly exports to date. cents, from an average of 123.0 cents in October to 116.3 cents in November. average of 6 and 3 cents, respectively. to Uni-.e. States or.ey at the current rates of excr'.- e.
Ij Yo. 2 Hard writer. 2/ :>. 1 Dark :.crthern Srrine. 3/ Ito. 3 M"nito' northern . wheat, vinclesale trade price free Central German Station. i h4 :115.6:126.2:122.0 :14.7: -- jcS.4'iW. 4:108.8:117.6:104.0:131. 1J Conversio-z at noon btyiz:-. rate of Exc'.-i:-e.
2J/ Teb n'r7- f't zres. 4/ October 1 to date. / ?eb'r-ary a:d lierch futures. 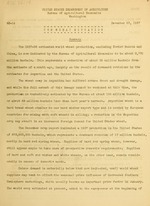 million bushels by July 1, 1937.
crops caused largely by abnormally low yields per acre. in 1937-38 than in 1936-37.
hard red spring, 102,408; durum, 28,749; and white, 111,120.
hard red spring and 1 million bushels each of hard rod winter and durum wheat. (1923-32) average are sho.n in tables 10 and 11.
when they averaged 326 million bushels. strengthened by confirmation of extensive dam-Age to the Ar'gentine crop. 1/ Weekly average of daily cash quotations, basis No. 1 sacked. 2/ No quotations Octnber 31 December 9, 1936 duo tc strike. / October 1 to date. 1/ Liverpool parcels not available. Compiled from official data except as otherwise noted. 1/ Estimate of the London office of the Bureau. 2/ Estimate of the Berlin office of the Bureau. j/ Estimate of the Paris office of the Bureau. of the Uorthern Hemisphere for which reports are not available. 191,984,000 bushels presumably does not take into account the. full frost damage. 1 North Dakota, South Dakota, and Minnesota. See table 10 for footnotes. /1 Estimate of the Paris office of the Bureau of Agricultural Economics. 2 Estimate of the Berlin office of the "
4/ Estimate of the London office of the Bureau of Agricultural Economics. make no estimate of durum production. 1/ Estimated by Paris office of the Bureau of Agricultural Economics. consumption, was introduced by the 1930 Tariff Act. into Cuba. On September 3, 1936 the consumption tax was repealed. Compiled from reports of the Department of Commerce. Compiled from Broomhall's Corn Trade NL-Ws. 1V Broomnall's Corn Trado News. -but does not include items 2 and 3. Compiled from official sources except as otherwise stated. 3/ Less than. 500,000 bushels. 4/ Net exports of less than 500,000 bushels.